With mosaic knitting, only one color is used for each pair of rows, but slipped stitches are used to pull contrasting-colored stitches up to create the vertical columns of color. 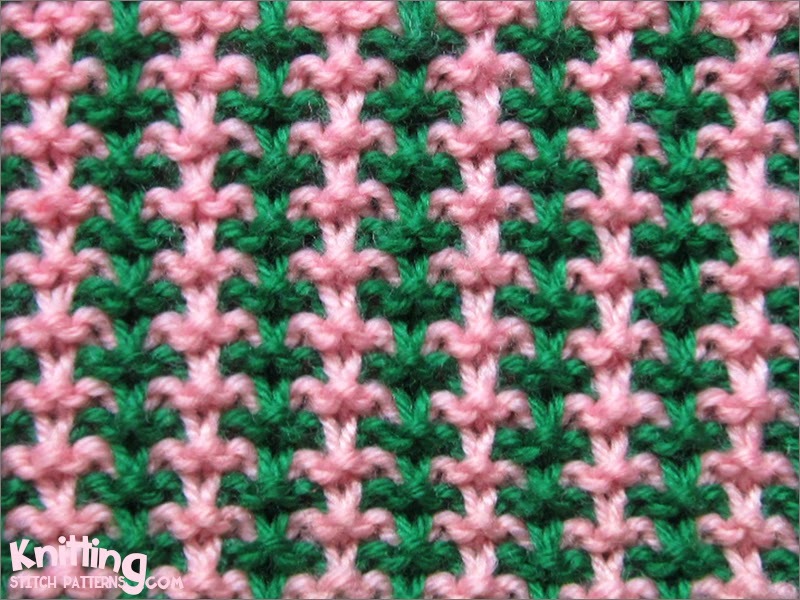 Plus, this stitch uses a garter-stitch based mosaic structure, so there are no purl stitches. Slip stitch patterns just work very well with alternating colors! Row 1 (RS): With color B, knit 3, * slip 1 with yarn in back (wyib), knit 3; repeat from * to end. Row 2: With color B, knit 3, * slip 1 with yarn in front (wyif), knit 3; repeat from * to end. Row 3: With color A, knit 1 * slip 1 wyib, knit 3; repeat from * last 2 sts, slip 1 wyib, knit 1. Row 4: With color A, knit 1, * slip 1 wyif, knit 3; repeat from * to last 2 sts, slip 1 wyif, knit 1. Repeat rows 1-4 till necessary for completing your project..